My mother called today... This is the best way to start any morning. Mom == Hi baby, how are you doing? GloZell== Great, the world is working in my favor, all is well. Bob Perlow the warm up comedian asked how you were doing. Mom == Tell Bob I said hello. He is such a great guy. Mom == That's great that Bob the warm up guy has a job. Mom == Has Jay given you a job yet? GloZell == (Yes! and it pays millions, I thought I would keep it too myself and not tell anyone..ha ha) No, not yet, these things take time. It's not Jay that makes these kind of decisions. Mom == Well,(chomping on some sugerless Orbit gum..the green color) Jay told everyone that he was going to get you a job! GloZell == I know, I know. Mom == How is your diet comming along? Are you still fat? GloZell== ah...umm...well... I need to go now. Mom == okay, you know fat people have it a little harder than thin pretty people. If your were thin you would be on Jay's show already. Fat people sit outside. Thin people on the show. GloZell (Really? That is remarkable, thanks for the info) Yes, mom you are right about that. Mom == Just don't eat anything white, like bread, rice, and drink plenty of water. 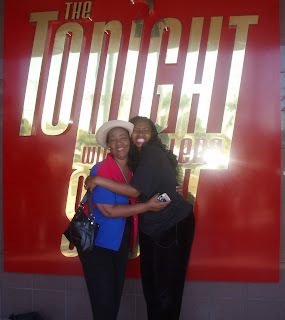 Mom == You know I love you, mommie loves her fat Tonight Show Baby. You can do it! You can loose 50 pounds or so. Just don't..
GloZell== I got it, don't eat anything white! Mom == Don't get huffy with me, young lady, and don't put this on your blam. GloZell == It's called a blog...a BLOG! Mom == Tell Boyfriend I said hello and to not take you out to eat so much. Or just order salad, without dressing or bread. GloZell == I will let him know. Talk to you later. Mom == Your Uncle Walter is in town...the one who walks on water. GloZell== I know who he is mom and no Jay is not going to put him on the show. Mom == You never know. He has been on TV already. Maybe he can help you. 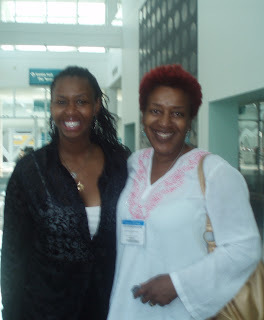 GloZell == Talk to you later, I got to go, I'm massaging at the Convention Center today. Mom == later baby, mommie is proud of you. Boyfriend informs me that his mother is not happy with the fact that I don't have a traditional job. That's just great. I don't blame her. 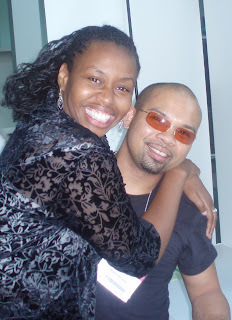 His mom and my mom can start MAGG( Mothers Agains GloZell Green) I have to keep thinking that one day...one day. I don't know what I am doing with my life. With my fat life. I just have to laugh, or I would be depressed. Yes, I have a uncle who walkes on water. I will talk about him more one day. His name is Walter Robinson, if you want to look him up. That's my mom's brother. My whole family is a TV show waiting to happen. I have an cousin who has been on TV including Jerry Springer! His name is Rev. Halo The Great. He gets in a coffin someone buries him. Then he preaches from underground. (I can't make this stuff up) My mother is the only on in the family who would let him in the house. He has got to be very old or even dead now. The list goes on. I have to go to work. Thanks for reading. I write, to make myself feel better. I hope this works for you, if you need a pick me up from time to time. I wrote this poem one morning when I was sitting in the Tonight Show with Jay Leno line all by myself. Things will materialize, just give it some time. in order to knock down doors and break some locks. There are two sides to every story and my side is right. I will turn around and even help you.